So many people are on Instagram these days and many people credit it with the downfall of blogs. It may be that people love the immediacy of Instagram. Me, I love the inspiration and camaraderie of it. I follow Karen Lewis on Instagram. She does incredible screen printed fabrics, and even sells bags and such. Not to mention she's got a book coming out called Screen Printing at Home. On Instagram I find her funny and wildly inspirational. If there wasn't a continent and ocean separating us I imagine a good old fashioned catch up with her over challah and tea. And then she would teach me just an ounce of what she does and I would explode with creative joy. A few weeks back Karen posted pictures of a bee project she has going on. 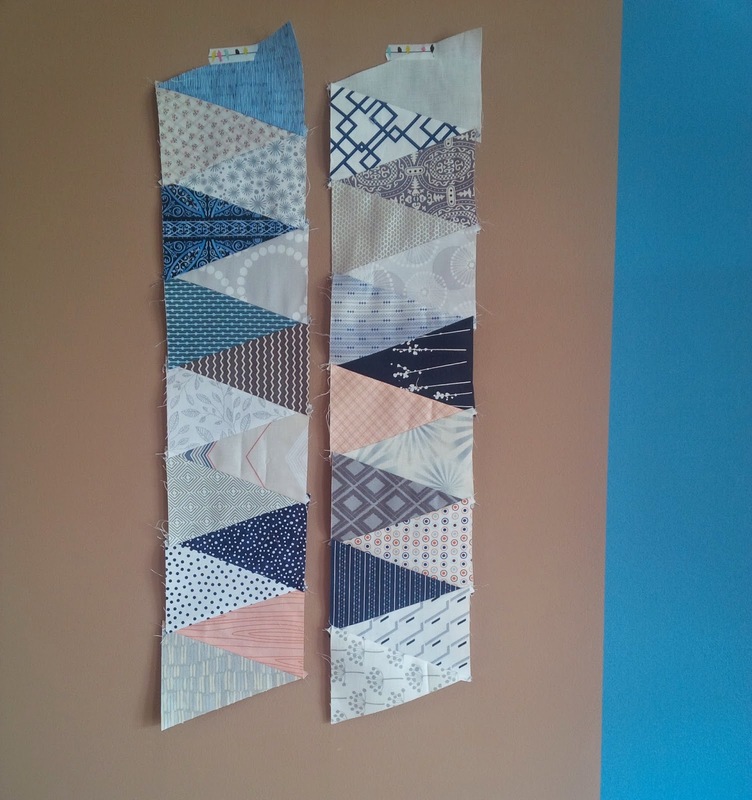 Her contributors are making rows of isosceles triangles, inspired by this incredible antique quilt. Now, I'm not in her bee. I'm quite a bad bee member, if I'm being perfectly honest. But I loved the fabrics and thought this might be a perfect small challenge. Maybe something to pull me a little bit out of my slump? While I cannot attest to the success or failure of a life changing bit of sewing, I can say that I quite enjoyed a little rustle through my fabric and an hour of sewing in the sunshine. That's a beautiful antique quilt and yours is looking just as lovely. Glad you found some inspiration. I can absolutely confirm that Karen is just as hilarious and lovely in real life as she appears on the interwebs! The first quilt I ever made was a thousand pyramid quilt. I hand cut 324 triangles for that quilt. I hand quilted it and even though it was six years from start to finish, I did finish it!